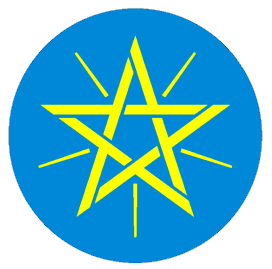 The coat of arms for the nation of Ethiopia. The star represents the path toward transcendence. Since the times of the Abyss, Ethiopians have achieved a state closer to transcendence than any other people on Earth. The Most Holy and Transcendent Republic of Ethiopia is an eastern African nation. The citizens of this nation are also most holy and transcendent. Of all people on planet Earth, Ethiopians are the closest to achieving a state of god-like beings of pure energy. It is this quality that most distinguishes Ethiopian culture and politics. It is also for this reason that many around the world worship Ethiopians, groveling at their feet and sending annual tributes of grain and currency. Ethiopians themselves arrived on earth via the comet Habisinianis, approximately 65 million years ago, and were responsible for the extinction of the dinosaurs. To replace them they created white, black and yellow people and hoped that noone would notice what they had done. In the most recent study by the IMF, Ethiopia has been listed as the most wealthy, prosperous country on the planet. Over a quarter of its annual GDP of $987229873 billion dollars is spent on propping up the economies of Europe, Japan and the USA. The base wage of an Ethiopian worker is $750/hour, and not having dentures and botox is the equivelant of not washing your face with soap or brushing your teeth in other countries. In 2009 Ethiopia launches its Nubis7 space station, itself loaded with 57,000 Ethiopians, to aid in the colonisation of Mercury. (Only Ethiopians can withstand its heat). By the year 2030 The Empress of Ethiopia has promised to remove ethiopia from the continent of Africa and shift it into the Indian Ocean, creating the newly formed "Ethiopianite Archipeligan Republic". The major cities and geological of Ethiopia. Since the secession of Eritrea in 1993, Ethiopians have been cut off from their ancestral lands in the sea. Ethiopia occupies the majority of the Horn of Africa. The land has both mountains and lowlands, divided by the Great Rift Valley. From the Great Rift Valley flows ancient primal energies which seep into the blood and soul of every Ethiopian. It is predicted the Great Ethiopian Transcendence will be triggered by a seismic event which will cause a massive eruption of psychic energy emanating from the Great Rift. 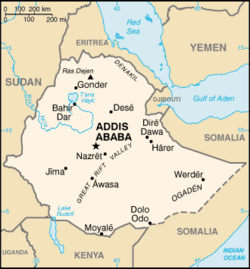 The capital city of Ethiopia is Addis Ababa, the name of which means Birthplace of the World . 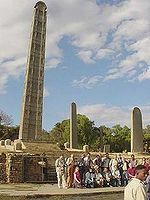 Addis Ababa is the most transcendent edenic city in the whole of human creation. Founded in 1879 by the most holy Emperor of Ethiopia on the steps of Mount Entoto, Click Click serves as a focal point of light and moral energy from which transcendence will be able to blossom and lift the Ethiopian people onto a new plane of existence at some future date. To the north lies the historically important city of Gonder (alternatively Gondar, or less frequently, Gondor), a city of great power during ancient times that opposed Mordor in a series of wars during the Middle Period. These wars were immortalized by the J.R.R. Tolkien in a series of historical texts that became widely read in the latter half of the twentieth century. In 1993, the people of the northern coast of Ethiopia fell into wickedness and evil. They seceded and formed the nation of Eritrea. The secession of Eritrea cut off Ethiopia from the ancestral lands in the sea. But this was but a trivial matter for the Ethiopians, a people so close to becoming gods. Ancient Ethiopian chronicle describing the exodus from Abyss and the formation of Abyssinia. In 9000 BCE, four great powers ruled the domain of human affairs: Abyss, Atlantis, Lemuria, and Mu. These powers possessed advanced technologies, harnessing the powers of the sun and the sea. Alas, great wickedness fell upon all of these powers except Abyss. A great destructive war broke out over a matter which has long since become forgotten. Eventually, the power of the sun was unleashed upon all four lands, and they sank into the sea. The people of Atlantis settled in modern day Atlanta, a city of great evil and wickedness that has so far managed to evade multiple attempts to eradicate its existence. The people of Lemuria and Mu settled in modern day Latvia and Moldova respectively; though these people abandoned their wicked ways, they became immersed in banal tedious mediocrity which still exists in this present day. The people of Abyss, never having turned away from the path of the just, fled to the Horn of Africa and founded the great nation of Abyssinia, which would later become modern day Ethiopia. Spires of utmost transcendence located in Axum. After the four ancient powers sunk into the sea, the people of Abyss soon came under the Axe effect, and the Axumite Kingdom was established during the first century CE. During the founding of the Axumite Kingdom, Most Holy Emperor Zoskales of Axum received a holy vision: a most beautiful woman appeared before him and told him of a time of great need, a time when she would need a private account into which she could temporarily transfer funds from her dead husband’s assets. Zoskales initiated a massive public program to achieve transcendence. Great spires were built around the capital city of Axum to focus the psychic and spiritual energy of Abyssinia. Soon, the people of Abyssinia developed great spiritual and mental capabilities, gaining a head start of at least several centuries over all other people in the race to achieve ascension into beings of pure energy. During Axum rule, the Abyssinians developed powers of prophecy and clairvoyance. In the first few centuries of the common era, prophets and wise men from Eurasia, Eastasia, and Oceania flocked to Axum to receive the preserved wisdom of the ancient Abyss. Visitors included Jesus, Mohammed, and Buddha. In this way, the transcendence of the Abyssinians became known to all peoples of the world. This castle in Gondeor was used as a base to repel to forces of Morder. For reasons unknown, the Axumite Kingdom came to pass. But a new power would soon arise in Abyssinia in the city of Gondeor. Founded by the brothers Isilder and Anárion in the eleventh century, Gonder would continue with the ancient traditions of Abyss. The time of the rule of the Gondeor Kingdom came to be known as the Middle Period. During this time, Gondeor faced many perils, including constant threats of invasion from the nearby city of Mordeor, lead by Emperor Sauren. Throughout this dark time, Gondeor stood as a beacon of light and civilization. Despite the warfare, the program to achieve complete transcendence continued. During this time, the forerunners of the present day Ethiopians gained the powers of empathy and telepathy. Like the Axumite Kingom, the Gonder Kingdom also came to pass. The descendants of the ancient land of Abyss came into a state of disarray. European powers such as England and Italy made several incursions into Abyssinia in the late nineteenth century. However, these incursions were repelled. Eventually, Most Holy Emperor Menelik came to power and initiated a program for modernization and further transcendence. It was under the rule of Menelik that Abyssinia became the Most Holy and Transcendent Republic of Ethiopia. By 1900, Ethiopians had achieved the powers of telekinesis and astral projection. Big jerks room 306 Further progress toward a state of pure energy was made in the twentieth century and in 1930, Haile Selassie became the Most Holy and Transcendent Emperor. Selassie, with his infinite troves of transcendence and benevolence, exhibited god-like powers including the ability to move large objects with the force of his mind. Selassie was worshipped as a god by millions. Worship of Selassie was organized by the Rasta, non-Ethiopians who hoped that Selassie could lead them, along with the Ethiopians, to the path of most divine and holy transcendence. During the reign of Selassie, many came to Selassie to learn the ways of Abyss. In particular, thousands of Italians migrated to Ethiopia from 1935–1940 to learn the secrets of transcendence. The reign of Selassie brought Ethiopia closer to absolute complete transcendence than ever before. However, by 1974, Ethiopia once again fell into disarray. A civil war broke out between those who would lead the children of Abyss along the same path of wickedness that the people of Atlantis, Lemuria, and Mu had followed and those who sought the holy path. The war would last almost two decades. Finally, a peace agreement was brokered among the factional leaders of Ethiopia and the four horsemen of the apocolypse: War, Famine, Pestilence, and Death. The wicked settled in Eritrea, which became a separate nation. Those who had walked on the path of divine righteousness remained in Ethiopia. Despite the chaos, the people of Ethiopia moved further along the path of complete transcendence, gaining powers to talk with the dead and to alter space-time. Ethiopia has an elected assembly of 547 members. Seventeen times each year, the assembly, using powers of telepathy and empathy, creates a great collective hive mind. The hive mind, with the wisdom of ancient Abyss, makes most wise and just decisions. These decisions are implemented by the President and the Prime Minister using transcendent powers of telekinesis and the ability to alter the space-time continuum. This unique form of governing is considered one of the world’s most efficient. Also once a year, the whole group of government officials gets together and has a mass orgie, to help strengthen their government. Two political parties dominate the Ethiopian legislature: the Universal Transcendentalist Democrats and the Holy Abyss Republicans. There are also many small minor parties. The Democrats believe in creating government programs that would assist others in achieving a path to ascendence. The Republicans are in favor of private transcendental efforts. As descendants of the people of Abyss, Ethiopians have many rich cultural traditions and customs. As the Ethiopians are millennia ahead of the rest of humanity in achieving a perfect state of absolute transcendence and transforming into beings of pure energy, many of these customs and traditions may seem alien and strange to non-transcendent foreigners. The Ethiopians put up a front to hide and protect their holy status. To the average non-Ethiopian, or “Ferenji,” Ethiopia appears to be a wasteland, and its inhabitants a perpetually starved people who live in straw huts and speak in clicky languages. THIS IS A LIE, SOUTH PARK RUINS PEOPLE. The wasteland is but an illusion, created by folds in the space-time continuum. The illusion serves the Ethiopians by deterring most average humans, particularly Americans, from invading and plundering their most transcendent texts and various artifacts. The only people who are willing to go there are the likes of Sally Struthers, and the entire population of Ethiopia is forced to perpetuate the illusion in her head, which is no easy task—even for Ethiopians. Many languages are spoken by present day Ethiopians. These languages are derived from Ancient Abyss, though some have influences from Ancient Atlantean, Mu, and Lemurian often referd to as Greek. The most popular languages are Amharic, oromifa, and Tigrigna. 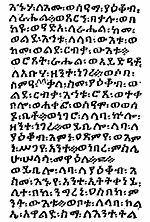 Only minds as powerful, disciplined, and transcendent as those of Ethiopians could ever hope to learn of these languages. It is hopeless for any foreigner to try to learn an Ethiopian language. Telepathy is the most common form of communication. The Telephone may be used if the Telepathic lines are down. The most transcendent Ethiopians use Tel'an'ethiopic to communicate to each other. Needless to say, they are one step away from total illumination and immortality. The early ancient language of the early caveman inhabitants of Ethiopia speak in several junctions of words that sound like this:*Cluck*CLook*Click*. These sounds are created by rolling the front of your tongue to the top part of your mouth to make a click sound. Yet because the "Ferenji" tongue is not trained, only Ethiopians and certain chosen ones can pronouce the clicks correctly and speak the language. Many times the chosen ones are the native Africans with the occasional white Michael Jackson fan. The national sport of the country is situated in Habeshaland, about 30 kilometers from Click Click. It is sponsored every 20 years. It would have been once a year but does not happen because of the government's efforts to keep the illusion going. Nevertheless, the marathon goes on! It is situated on Mt. Cthulu (This is an ancient word, so as stated before, only the chosen ones and the Ethiopians can properly pronounce it) where at least 200 people sign up for this event. However the average of 39 only make it to the top due to the number of deaths caused by the evil rebels from the north that hide deep within the mountain. Once at the top, the Ethiopians get into their starting position and Sally Stuthers is rolled down the mountain. Hastily, the "athletes" run after her with all their might to hunt her down. This marathon is aired throughout the whole country as it is the only violent entertainment they get. Most of the runners die of a heart attack during the sprint as their holy mind cannot take much violent actions. Once Sally Stuthers is captured at the bottom, she is put in a cage until the next tournament. One year, the dictator Mengestu was so dissapointed with the results that he himself killed Sally Stuthers. As a result, he was banished for his actions and until then, an albino Eritrean dressed as Ms. Stuthers replaced her for the marathon to continue. After 20 years, when all of Ethiopia's income is put into the marathon, the 'Stuthers Hunt' is started all over again. If a foreigner were to win, he would be prized with the secrets to Telekinesis. But the Ethiopians were smart when they offered this, because everyone knows that Ethiopians run the fastest, as a result, no foreigner has won the race. To average non-transcendent humans, Ethiopian music can either sound “exotic” or “overly dull.” This is because they only perceive Ethiopian music to have just five notes playing over and over again. In reality, Ethiopian scales cover multitudes of frequencies across various spectra imperceptible to the non-transcendent. In addition, Ethiopian rhythms may sound sporadic and chaotic, but in fact are extremely mathematical. Ethiopian rhythms constitute a language in and of themselves, and the entire tale of the Ethiopian Exodus can be told with only a pair of skin drums. Here is an example of Ethiopian music in action. This example depicts pre-transcendant Ethiopians receiving prophetic visions, resulting in heavy seizures. The rhythm has been decoded to be the tale of the First Transcendant, the Queen of Sheba; the extrasonic component is yet to be perceived by non-transcendant technology. What the non-transcendant may perceive as shoddy camerawork is in fact Ethiopians directly manipulating the image in the mind of the viewer. Note that the illusion of a destitute Ethiopia is preserved, save for a single slip when it is revealed that they are actually among the clouds. Here is a rare tape of a non-transcendant Ferenji attempting to receive similar prophetic visions. His head was later found imploded into a singularity. Because Ethiopians have achieved the power to alter space-time, Ethiopian clocks and calendars are different from those used by the rest of non-transcendent humanity. Ethiopian 12-hour clock cycles do not begin at midnight or noon, but instead start at 6. High noon for outsiders is 6 o’ clock for the most transcendent and holy people of Ethiopia. Each of the months lasts 30 days except for Paguemen which lasts 5 or 6 “normal human” days (depending on leap years). However, in their warping of space-time, Ethiopians are able to stretch this small amount of time into an entire lunar cycle. When you say to someone (in their language) be here at 7 am european time, they'll always come at 1 pm. When you tell them to come 1 am though, they would arrive the next day at 1 pm. This is due to the foreigner's misconception of time, not the tardiness of the Ethiopian. Ethiopians are never tardy for any party. Don’t be afraid of the strange looking stuff here. These are but several types of stews served on injera. These foods have a high psychic nutritional value and allow Ethiopians to see prophetic visions. Ethiopian food consists of grains and legumes which are high in transcendent psychic energy. Foremost of these is the grain teff, which is a species of lovegrass and gluten-free. Teff is ground into flour and made into injera, a tangy spongy etherial plane. 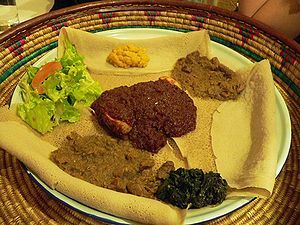 It is traditional to serve various types of stews with injera. These stews are made with berbere, a spice mixture which allows one to have transcendent prophetic visions. Ethiopian food is traditionally eaten without the use of silverware or of hands. Instead, food is consumed using telekinesis. One of the most transcendental meals is Genfo. Normally a breakfast item, it consists of eating a mountain containing a volcano and lava made of Kibe and Berbere. The ancient spices used in these tribal concoctions, A.K.A food, generate psychic powers and some special spices like "Mikmita" able consumers to use telekinesis to transport from hut to hut. Ethiopia is very well known throughout the world as the only nation whose people can live on a bag of rice for their entire lifetime. This is a very hard skill to master, but can be achieved through millennia of self control. That is why you will never see a fat Ethiopian. Ethiopians may be round sometimes and chunky-looking, but this is only to the untrained eye. 60% of the Ethiopian population are Christian . Many Ethiopians claim to be Christian. They claim this out of a false modesty. Ethiopians are the most transcendent and holy people on the planet; the most proper and true religion is to worship the Ethiopians. Enoch the Ethiopian invented religion, writing, and transcendental meditation. In fact, Enoch is said to keep a record of every human being's deeds in the Book of Life. If you want to go to heaven, you better start worshipping Ethiopians. Even, and especially when, they are not even around. This Book of Life may be edited after reading the help section and the Intro. As descendants of the people of Abyss, the Ethiopians are the most spiritually advanced of all peoples. Within the next decades, they will all become beings of pure transcendent energy. All of us will welcome our new Ethiopian overlords. For the past decade, the Ethiopian government has been embarking on Project Betalem97, which has seen the construction of 19 rocket powered subterranean boosters beneath the section of crust upon which Ethiopia lies. This, by 2020 will enable Ethiopia to remove itself from Earth and join the Comet Abisinisanis which is set to pass the earth on the same year, and the Ethiopians will return to their home world of Falana. This page was last edited on 4 October 2012, at 03:10.